Happy Thanksgiving, everyone! I hope everyone is celebrating the holiday with friends and family today. And since it's now Thanksgiving, it means we're moving into the holiday season - my favorite time of year! So its time to start baking cookies, candies, and other festive treats. I love doing holiday baskets every year, and while I try to include several different treats, classic cookies like chocolate chip and peanut butter are always well-received. I normally really really hate shortening, but Annie was pretty adamant about it being necessary for these cookies. So I tried it out, and while I wouldn't call myself a "shortening convert," it does work in these cookies. And its such a small amount that I'm willing to use it without a fight. I made these cookies for the Bedtime Stories Bridal Shower a few weeks back, and they were a big hit. Soft and chewy, with a sweet, crackly crust and lots of peanut butter and honey flavor. 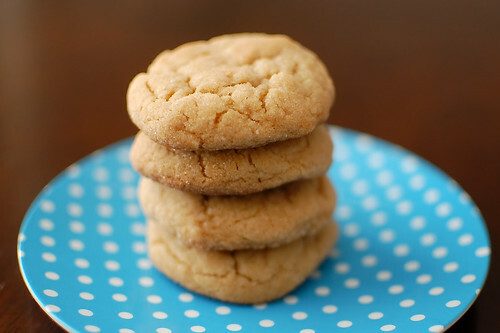 These have the best texture of any peanut butter cookie I've ever made, and even though this recipe made a ton, and we had plenty of leftovers, they didn't last long. sugar, for rolling the cookies. Whisk together the flour, sugar, baking soda, baking powder, and salt. In the bowl of a stand mixer fitted with a paddle attachment, cream together the shortening, butter, peanut butter, and honey. Add the eggs, one at a time, mixing well after each addition. With the mixer on low speed, add the flour mixture, beating until just incorporated. Roll the dough into 1 1/2-inch balls, and roll each ball in the sugar. Space each cookie a few inches apart on the cookie sheets. Bake 10-12 minutes, until the cookies are slightly puffed and golden. Remove from the oven and allow to cool on the baking sheets 5-10 minutes, then transfer to a cooling rack to cool completely. Repeat with the remaining dough. i saw these cookies on annie's eats too and have been meaning to make them, but never got around to it. thanks for the reminder, they look yummy! Oooh, I have made a variation of these cookies... they are one of my favourites! I absolutely love baking with honey! Yum! You can't go wrong with peanut butter. These look delish!